An advantage of living in Birmingham is that it has excellent public transport and a bus pass which allows free travel on all buses and trains within the West Midlands after 9.30 on weekdays and all weekend. Accordingly, I had taken the Excelsior into the NEC on Wednesday morning and made my way home on two trains and was running for the bus for the last leg of the trip when I had another sort of trip causing me to make contact with the pavement in a manner which caused me superficial, but uncomfortable, body damage. I did catch the bus and it was only after I had washed the dirt of of the grazes on hands and nose and made a cuppa that the irony occurred to me: the cause of the trip was the dimples on the pavement which are there to warn blind people that they are approaching a dropped kerb. So I had been tripped up by a safety feature! However, since I can still see and run and am three score and ten plus, I can accept that there is a funny side to it. I hate those things, Luckily around here they put nearly all dropped curbs in the wrong place, another pet hate of mine. At the show I did notice you with a few nasty grazes, I thought one of you Midas had bit back. I hope you are on the way to a speedy recovery. Talking about irony, even though I'm not a great lover of motor bikes, I must confess that one of my favorite exhibits at the show was a motor bike and never thought I would accidently see it in a million years. Straight after leaving the club stand we approached a few book stalls, where I noticed a speedway bike on top of a bench. 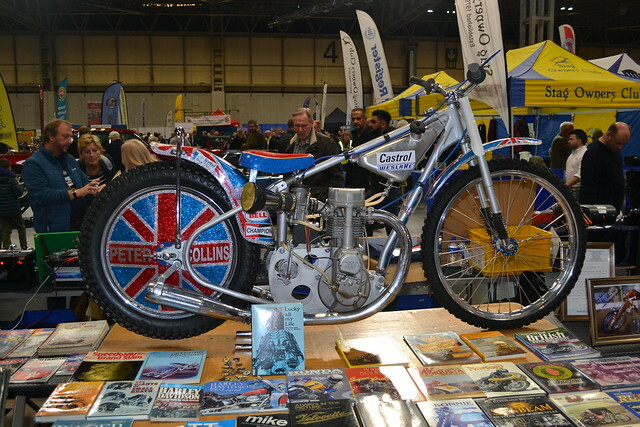 Many years ago, as well as F1 I used to follow Speedway and I was a big fan of a British rider named Peter Collins who became world champion in 1976. As we came closer to the bike even though we were on the wrong side I said to the wife "that looks like Peter Collins's bike, he had union jack mud guards and a filled in rear wheel with his name on" I quickly scurried round to the other side and low and behold it was his bike so out came the camera. The irony of it is that all the expensive cars on display and for me a simple speedway bike at the back of a book stall stole the show. Part of the pleasure in running a Midas is that you can park it next to a Ferrari or Porsche and folks take more interest in yours.